33 year old Rajesh, from India, uses a wheelchair. He used to struggle to be recognised and included by his family and community. 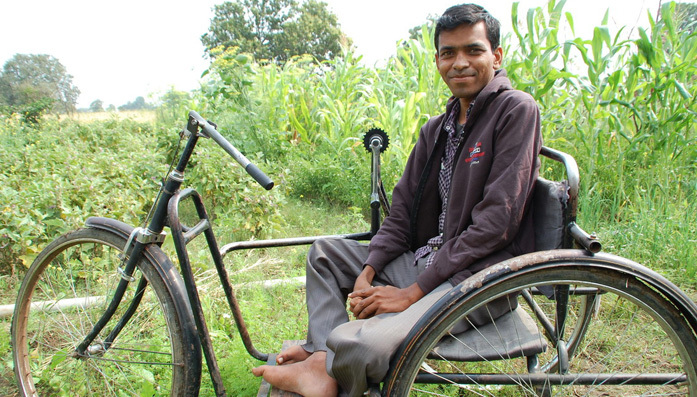 But since taking part in CBM’s organic farming programme, he has set up a thriving business and is showing others that disability doesn’t have to be a barrier to success. I have always tried to help with the farming, but my abilities were not recognised in the family, or in the wider community. I used to sit under the porch and feel really down. I used to focus on what I couldn’t do, rather on what I could. You see my nervous system was damaged when I was born. I wished I could be like my three brothers, working on the farm. I had heard of [CBM partner] Naman Seva Samiti, who specialised in organic farming with farmers with disabilities, so I arranged a meeting with one of their guys, Krishna. From that day, I haven’t looked back. I got trained in organic farming and the techniques involved. We identified some land on the farm that I could turn into an orchard. Naman built me this trike, which I use around the farm. I grow lemons, peas, mango, wheat, and all sorts of other seasonal produce. I now have a large, and growing, customer base. People like my produce because it looks good, tastes good, and is good for them. Before this they didn’t have much time for me. They weren’t hostile as such; it was more like they didn’t notice me. Now I have respect from them. They see me as a person, a successful person. They see people like me – people who had nothing, who felt like they were nothing, and they see the change in our farms, our crops and our lives. They see that we can save a little bit of money and better ourselves. I have plans for the future. From sitting around, I am now a leader in my community and am fully independent.